In 1957, Si Kenen started a newsletter — Near East Report — to inform the public about events relating to the Middle East. Much of what he published in NER was current, but he also recognized the need to educate readers about the Arab-Israeli conflict and to debunk myths perpetrated by those who wished to rewrite history to suit their own purposes. Toward this end, NER began to publish special surveys of pertinent issues. Gradually these analyses grew to book length and were published as Myths and Facts. Myths about the Middle East did not originate in the 1950's, nor have they ceased to be promulgated. The tumultuous events in the region seem to be consistently accompanied by all new distortions of the facts about the Arab-Israeli conflict. With Near East Research's permission, and by popular demand, AICE produced an updated version of this classic text. This version has the advantage of being hyperlinked to the vast resources available in the Jewish Virtual Library and is constantly updated as new events occur. The response to our online version was overwhelming and people began to ask for hard copies of the text. Consequently, we published a version in paperback for quick, easy reference. I recommend you purchase a copy to keep handy for use when you can't get online. New myths that emerge after publication of the book will be incorporated online with the corresponding facts. To receive a weekly myth and fact and periodic fact sheets by email, send a request to mgbard@aol.com. AICE is also pleased to offer a variety of translations online. Currently, we offer Spanish, German, Portuguese, Russian, French, and Swedish These are also available in paperback. We have also recently added a chapter to the English edition on Canada-Israel Relations written by David Goldberg. "Truth," Lord Acton said, "is the only merit that gives dignity and worth to history." 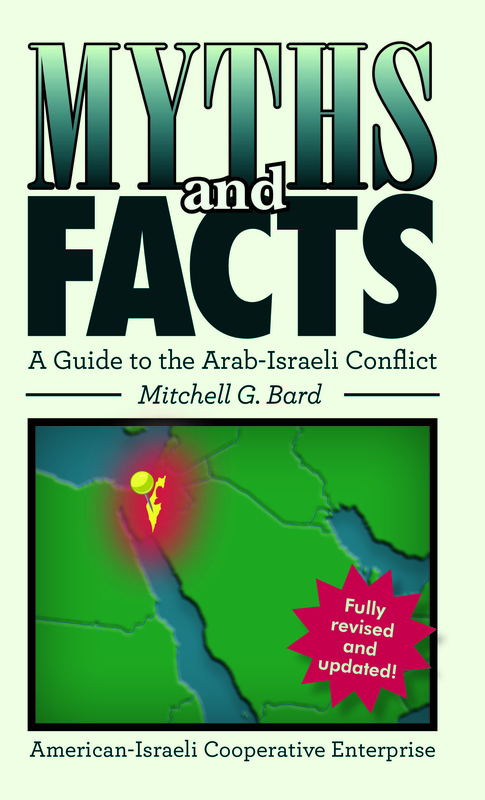 The following pages lay out the truth about the Arab-Israeli conflict. It is the best weapon we have against the purveyors of falsehood. "...[a] well-designed, succinctly phrased book.... This new, revised, enlarged, updated, and inexpensive edition ... is filled with concise historical research..."
"The footnoted book contains more than 100 pages of historic documents and maps, making it more useful than ever...."
"The best way to fight myths are with facts. All the facts you'll need are in this book." "The discussions are concise yet thoroughly canvassed."